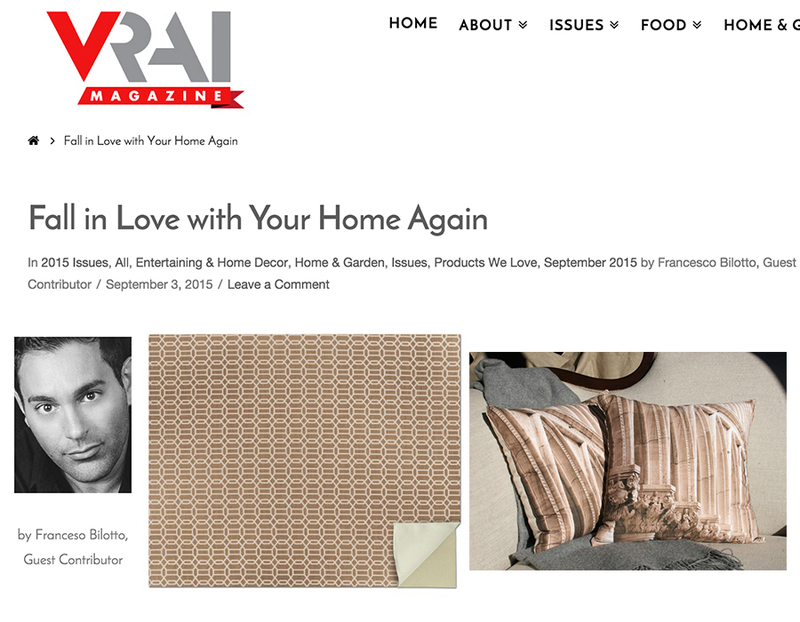 Congratulations to our Clients Ruggable and Arcadia Park Designs for their feature inÂ VRAI Magazine!Â Favorite home dÃ©cor brands hand picked by Designer Francesco Bilotto. Cozy up those floors with Ruggable.Â Not just your normal rug, this stylish â€œgame changerâ€ is machine washable.Â This fretwork combines contemporary bold lines with traditional colors giving it broad appeal. The design is versatile enough to combine with other patterns for a layered look this fall, but is bold enough to be the central focus surrounded by solid basics.Â Check them out at Ruggable.com! Nothing makes a room feel more inviting yet sophisticated than a few elegant and thoughtfully designed pillows.Â Each Arcadia Park Designsâ€™Â pillow is individually produced in Vermont. The images are the work of artist Katherine Henry and are printed using the same methods employed to create limited edition digital fine art prints. Check them out at Arcadiaparkdesigns.com!